In this Oct. 29, 2018 photo, Chinese State Councilor and Foreign Minister Wang Yi and Foreign Affairs Secretary Teodoro Locsin Jr. jointly meets the press after their talks in Davao. Upon the invitation of Wang, Locsin will undertake an official visit to China from March 18 to 21. MANILA, Philippines — Foreign Affairs Secretary Teodoro "Teddy" Locsin Jr. will undertake a four-day official visit to China next week, the Department of Foreign Affairs announced Thursday. This will be his first visit to China since assuming the top DFA post in October last year. Upon the invitation of Chinese State Councilor and Foreign Minister Wang Yi, Locsin will be in China from March 18 to 21. 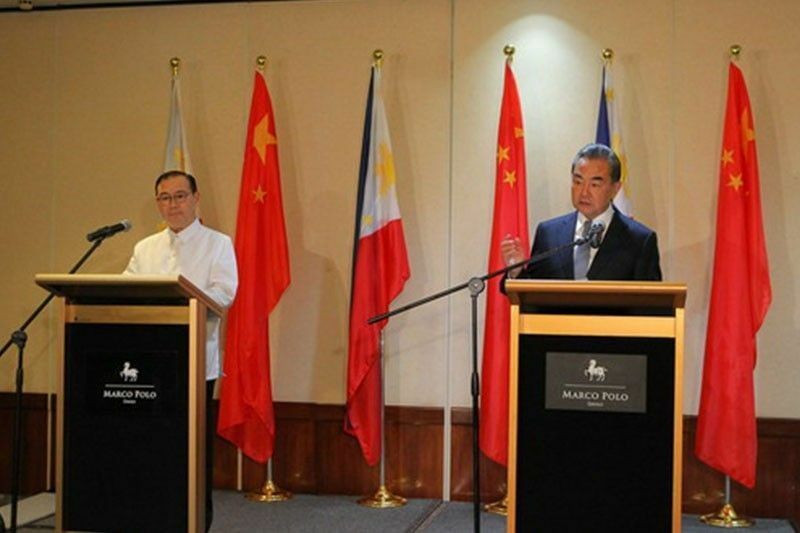 "Secretary Locsin and his Chinese counterpart will hold a bilateral meeting to discuss the strengthening of the friendly relations between the Philippines and China in the spirit of mutual respect and through enhanced functional cooperation," the DFA said in a statement. The two foreign ministers are also expected to discuss "ways to advance the larger goal of bringing about peace and prosperity to the region." The Philippines and China have been embroiled in a maritime dispute over the South China Sea, where the latter had constructed artificial islands and installed military facilities. Under the Aquino administration, the Philippines lodged an arbitration case before a Hague-based tribunal against China's nine-dash line claim over the South China Sea, part of which is the West Philippine Sea. In 2016, the international tribunal ruled in favor of Manila, invalidating Beijing's expansive claims over the contested waterway. The Duterte administration, however, opted to hold a bilateral consultation mechanism with China to settle the dispute. In March 2018, Locsin's predecessor Alan Peter Cayetano flew to Beijing to discuss the possible joint exploration in the West Philippine Sea. A few months after the March visit, Cayetano would declare that the two countries agreed not to set a deadline on the possible joint exploration. The Philippines' initial proposal to China was a 60-40 sharing in favor of Manila. During Chinese President Xi Jinping's official visit to Manila in November, the Philippines and China signed a memorandum of understanding on oil and gas development. Locsin later on clarified that the signed MOU was a deal to "agree to arrive at an agreement" as early on declared by Energy Secretary Alfonso Cusi as there is no agreement yet on the proposed joint exploration in the West Philippine Sea.